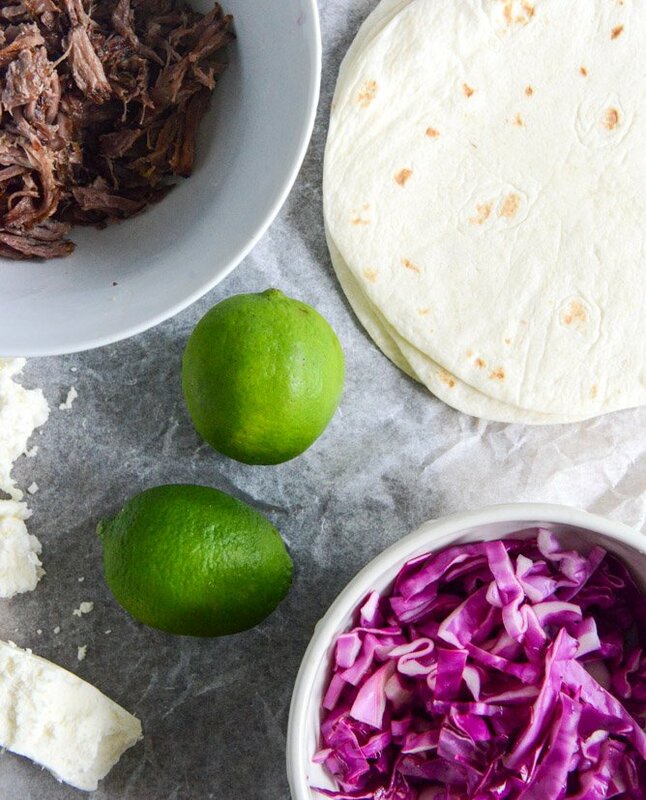 Crockpot Smoky Brisket Tacos with Shredded Cabbage + Sweet Corn. Could I be any more predictable? I have to make a version of one or the other every week and oh, you know – pizza was yesterday. You betcha. So today, it’s taco Thursday. I have been trying to get out of my comfort zone with beef. If you haven’t noticed, I’ve only made a billion (or like five) recipes with flank steak because besides that, filet is the only other beef I feel totally comfortable preparing. Read: I know that it will turn out great. I’m a big scaredy cat when it comes to other cuts of beef. Read: I’m a giant baby. My grandma use to make a lot of brisket – it was one of her specialties. Needless to say, I haven’t had it since she passed away in 2009, other than a taco here or there. And I figured that it was pretty hard to screw up tacos (hello, cheese and tortillas), so I decided to get out of my comfort zone while staying in my comfort zone. Does that still count? Plus, the crockpot makes everything taste good. It’s like a magic machine for meat. Sort of. Just kidding. Not really though. I’m lazy. These aren’t too different than my favorite short rib tacos but… they are still different. For starters, it’s clearly a different cut of beef, but these babies are topped with corn and red cabbage. If you told me ten years ago that I’d be eating raw cabbage, I’d laugh hysterically right in your face. Tacos do that to me. 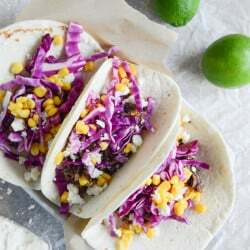 Now, cabbage is one of my favorite taco toppings since it’s so crunchy and fresh. Add a little corn… add a little cheese.. boom. Dinner is done. Season the brisket with the salt, pepper, paprika, cumin, onion and chili powder. Place it in the crockpot and add the beer, then cook on low for 8 hours. When finished, if the brisket is still in 1 piece, remove it and place it on a cutting board. Use a sharp knife and a fork to shred the brisket (you can also do this in the crockpot) and then place it back in the crockpot for another 30 minutes. It should combine with the juices and soak them toss. You may need to toss the beef a few times in the crockpot. When you’re ready to serve the tacos, add the cabbage to a bowl and toss it with the lime juice, olive oil and a pinch of salt and pepper. Assemble the tacos with the beef, the cabbage, a few spoonfuls of the corn and the crumbled cheese. Also, look at this color! That means health. Right? 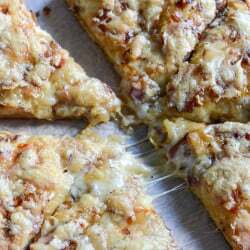 Caramelized Onion, Gruyere + Pepper Bacon Whole Wheat Pizza. Vacation Photo Dump, Part 1.